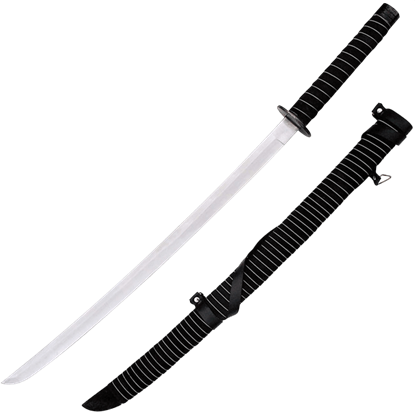 Stage Steel swords are battle ready, full-tang and durable swords of rigid steel featuring blunt edges for Live Action! The European battle ready swords feature a hammered and blackened iron pommel and guard welded to a hefty steel blade. The grip is padded with leather and wire wrapped. Oriental swords have a smoother darkened tsuba and end cap and feature the same great leather and wire wrapped handles. Each of these full tang battle ready swords has been crafted by hand with the blade made from a single thick rigid piece of steel that extends the length of the blade through grip with heavy welded guards and pommels. These swords are durable and suitable for stage battle and reenactment fighting and come to you at a great price. The Double Handed Broadsword features a hammered, blackened iron pommel and guard welded to a hefty steel blade. The Double Handed Broadsword is durable and suitable for stage and reenactment fighting, all for a great price. The Giant O Dachi Sword features a smoother darkened tsuba and end cap and feature the same great leather and wire wrapped handles. The Giant O'dachi sword comes complete with sheath. This is a hand crafted, battle ready sword. 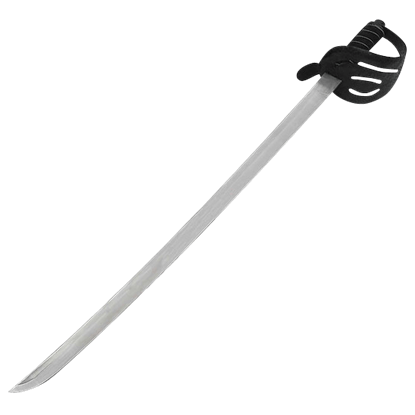 The Stage Steel Ninja Sword is a durable full tang weapon of rigid steel featuring a blunt edge for Live Action. The grip is padded with leather and wire wrapped with blackened iron tsuba and end cap. Many a bloody-handed pirate of the 17th century clambered over the side of a gold laden galleon armed with a cutlass such as this. This sword was known by many names, including hanger, short sabre, and cutlass. The Reverse Blade Katana features a smoother darkened tsuba and end cap, as well as the same great leather and wire wrapped handle. 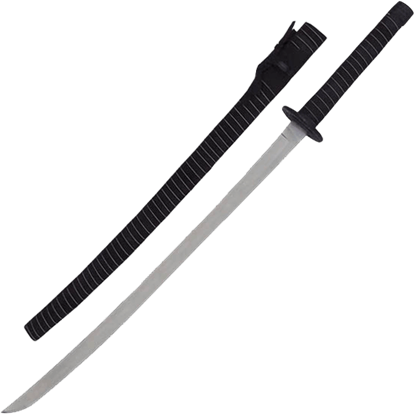 The Reverse Blade Katana is suitable for stage and reenactment fighting and come to you at a great price. 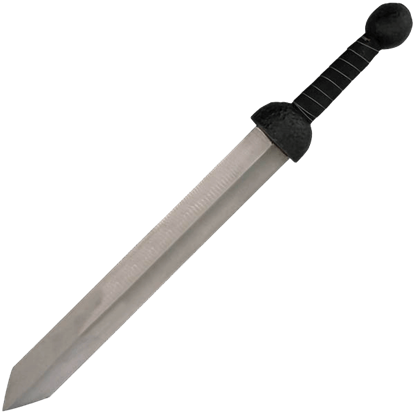 The Roman Gladius Sword is durable and suitable for stage and reenactment fighting and come to you at a great price. It features a full tang with the blade made from a thick, rigid piece of steel that extends the length of the blade. This Samurai Katana with Sheath is for all you stunt and theater professionals. 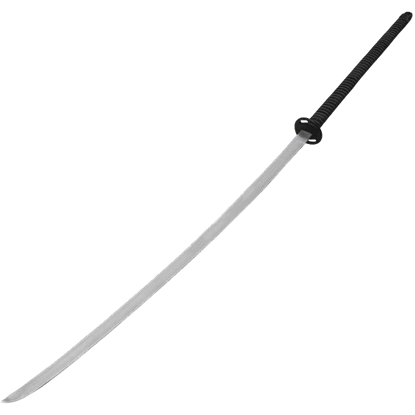 The Samurai katana was made specifically for re-enactments and stage fighting. The katana features a full tang and the blade is made of high carbon steel. The Single Handed Broadsword features a hammered and blackened iron pommel and guard welded to a hefty steel blade. It is durable and suitable for stage and reenactment fighting and come to you at a great price. The Single Handed Short Sword features a hammered, blackened iron pommel and guard welded to a hefty steel blade. The Single Handed Short Sword is durable and suitable for stage and reenactment fighting and come to you at a great price. The Tai Chi Sword features a smoother, darkened tsuba and end cap, and feature the same great leather and wire wrapped handles. The Tai Chi Sword is durable and suitable for stage and reenactment fighting and come to you at a great price. The Viking Short Sword features a hammered and blackened iron pommel and guard welded to a hefty steel blade. The Viking Short Sword is durable and suitable for stage and reenactment fighting and come to you at a great price.